Our Sonos music system helps get the party started! Dates go fast and we are frequently sold out on the weekends! To hold your party date, a deposit is required. Deposit is non-refundable. SPECIAL PACKAGE FOR BRIDES TO BE! Looking for a fun, unique, and creative option for a bachelorette party? We offer the best option that everyone is talking about! Works well with a dinner before or after at one of the many restaurants in the Village of Wauwatosa. Park once, party all night! No need to worry about how to squeeze everyone into your home, we have plenty of room to spread out! Bride paints for free with 15 or more paid guests. Dates go fast and we are frequently sold out on the weekends! To hold your party date, a $250 deposit is required. PRICING- Sunday through Thursday $35 per person, $350 painting minimum (10 paid painters). Friday and Saturday $35 per person, $525 painting minimum (15 paid painters). The bride paints free with a minimum of 15 paid guests. Host to collect painting fee from guests - We suggest doing so in advance. Artist gratuity is typical but optional. Food & beverage available to purchase with an 18% service fee added. This is a private painting party, not a room rental and is 2 hours long. You may arrive 15 minutes early if needed for any set up. Need additional time? It is available to purchase in 30 minute increments. No more worrying about what will happen to your house when hosting your child’s birthday party! Birthday child gets to select the painting taught from our gallery of age appropriate "kid's paintings"
Each child gets a "kiddie cocktail"
Each guest takes home a completed painting to hang on the wall! $75 deposit required to hold party. Deposit is non-refundable. PRICING - Painting class during 90 minutes of studio time. $25 per child with a $225 minimum (9 paid painters). This is the newest way to connect with your staff, customers & guests in a fun, non-traditional "office" environment! Perfect for networking, team building and growing business relationships. We can provide you with names of local caterers if a meal is desired. There is a flat $50 fee that includes extra tables, tablecloths, assistance with clean up, and garbage disposal. The one hour complimentary time can be used for dining if desired. Small Group Rate - 15 or less painters. Sunday through Thursday $35 per person, $350 minimum (10 paid painters. Friday and Saturday evenings $35 per person, $525 (15 paid painters). Artist gratuity is typical but optional and a great way to say thank you for an outstanding event. Large Group Rate - 16 or more painters. Sunday through Thursday $30 per person, $480 minimum (16 paid painters). Friday and Saturday evenings $30 per person, $600 minimum (20 paid painters). Artist gratuity is typical but optional and a great way to say thank you for an outstanding event. Corporate tab, cash bar or drink ticket system is available for beverages, with an added 18% service fee. 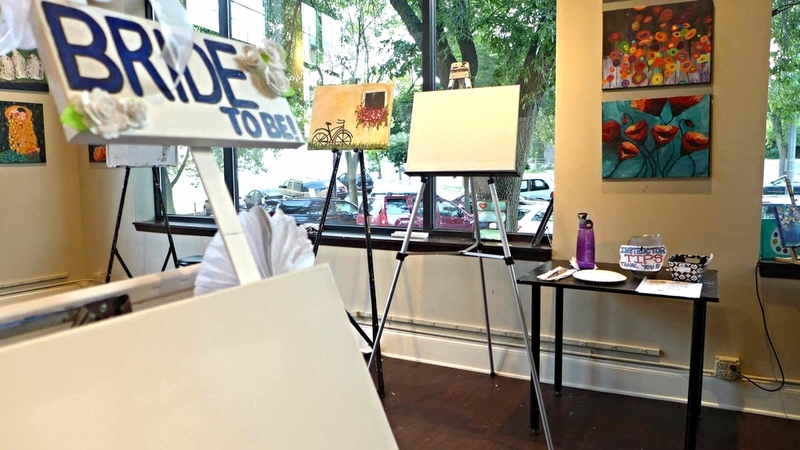 This is a private painting party, not a room rental and is up to 3 hours long, including painting. You may arrive 15 minutes early if needed for any set up. Need additional time? It is available to purchase in 30 minute increments.